Looking for something to watch this weekend? Check out some of my favourite healthy movies below. I can’t believe that this film is over 10 years old!!! It was the first documentary I watched about food and health. Morgan Spurlock filmed his experience of eating nothing but McDonald’s three times a day for an entire month (supersizing his meals of course!) and tracked his physical and emotional health, which deteriorated at a shocking speed. He also talked with other Americans who subsist largely on burgers, fries and fizzy drinks while showing how the fast food industry uses marketing to get us to consume more. An oldie but a goodie. In sort of the same vein, That Sugar Film follows Australian filmmaker Damon Gameau as he embarks on a unique experiment to document the effects of a high sugar diet on a healthy body. The twist with this film is that he’s not eating fast food but rather foods that are looked on as ‘healthy’ but in actual fact are loaded with sugar – health cereals, juice, yogurts etc. Another film about the ill-effects of sugar is Fed Up. Narrated by well-known US TV presenter Katie Couric, this doc delves into the role sugar plays in the obesity crisis and how big business is impacting the epidemic. One for people who don’t really understand just how much sugar goes into the foods we eat every day and how it affects our bodies. Eye-opening! Food Inc. is a film that covers the food industry from a corporate perspective. It highlights how the way we eat and what we eat has changed over the last few decades and why. It lifts the lid on some of the world’s most powerful food companies and why they want to hide what’s in the food they manufacture. By the time you finish watching you’ll have a better understanding of the importance of food and how you can make the best choices in your daily life. On a similar vein to Food Inc., Hungry For Change looks at the lies food companies tell us. Part expert advice and part first-person testimonial, you’ll come away convinced that giving up processed foods and eating clean will make a huge difference when it comes to your health (and waistline). Food Matters discusses why our food is so important and how it can and should be our medicine. It highlights the amount of pesticides, gmo foods and pharmaceuticals etc we are consuming and why they aren’t in the true best interest of our population. It differentiates between managing symptoms with pharmaceuticals and healing our bodies with real health solutions. In this film Australian Joe Cross starts off fat, sick (and nearly dead) and decides to tackle his illness head-on with changing his diet and lifestyle. He embarks on a juicing challenge and we get to follow him on his journey back to health. There’s also a number of inspiring stories of people who get a new lease on life after redesigning their diet and exercise habits. Uplifting and will have you reaching for the green juice! Also touting the benefits of juicing is Jason Vale Super Juice Me. Eight people with various illnesses are put on a juice fast in Jason’s retreat in Portugal. The results are amazing. I was particularly interested in this doc as there was an Irish girl who had Crohn’s disease who took part. It’s made me want to go to that retreat! This film focuses on the scientific proof that a diet full of plants and free of processed foods is the one that works best for our bodies. While it does take on some of the ethical principles of veganism, it’s more about the benefits of plant-based diets (and there are many eating styles that can be plant-based and not vegan). While not about diet, this sweet and meaningful documentary looks into the history of happiness, how it differs from culture to culture, and what you can do on a regular basis to become happier, healthier, and more fulfilled in your everyday life. Feel good film! Have you any recommendations for me? Always looking for inspiration. Over the last few years I’ve put a lot of emphasis on cleaning up my diet, trying my best to avoid processed foods and pesticide exposure by choosing organic whole foods when possible. But the endocrine disrupters in everyday cosmetics and toiletries can be just as harmful to our bodies. Our skin is our largest organ and its pores provide a natural way for the body to detoxify. So what we put on our bodies is just as important as what we put in them. Which is why I’ve been trying to switch to more natural products that lighten the toxic load on my body. Here are some tips I picked up along the way that may help if you are wanting to transition to more natural beauty products. There’s no need to throw out your entire toiletry and make-up bag in one go. I would have found the idea too daunting (and expensive) so I’ve tended to replace things as they run out which gives me time to do a bit of research on products I want to try. If you are confused about what changes would give the most bang for your buck, I’d say start with switching out products that are used closest to your skin (and therefore definitely get absorbed) and that sit on your skin the longest. Body lotion, face moisturizer, deodorant and foundation spring to mind in comparison to shampoo and conditioner which are rinsed out after a couple of minutes. I found the American website Skin Deep by the Environmental Working Group really insightful and was shocked by how toxic some of my favourite products were. They colour code products like a traffic light system, green is ok but red means that there are a lot of toxins and they also rank the level of toxicity from 1 to 10 so you know just how toxic a product is. While the site is for products sold in American and European regulations mean that products may vary slightly here, it’s still a good website to get an idea of what isn’t too bad and what should probably be tossed. I found out that the foundation that I’ve been using years and was feeling guilty about using isn’t actually too bad. While it isn’t the best choice possible it’s still in the green zone so I’m prioritising switching out other products first while still experimenting every now and then on more natural foundations until I can find one that I like. This is where I feel a lot of people are caught out. They look at the front of a product and they see “natural” and think they are making a great choice. But just because it says it’s natural, it doesn’t mean it is. There’s a strategy of “greenwashing” used in the cosmetics industry where some brands spend more time and money claiming to be “green” through advertising and marketing than actually implementing business practices that actually make so. So take a minute and question what the advertisement and packaging is actually saying. Much like I tell clients to read the ingredient lists of food they eat, it’s good to have a look at the ingredient list on cosmetics and toiletries. I was surprised at how many ingredients went into making products and that I didn’t have a clue what they were. Now when picking out products, I look for the biggest offenders: fragrance, parabens, sulfates and phthalates. If they’ve got any of these, I pass. Then I look at the other ingredients and the order they appear. This is a good way to see what the product is mostly made of as the ingredients are listed in order from most to least. I started looking for new products in my local health food store as I thought the chances of getting cleaner products there were higher. Between getting recommendations and doing research I was able to discover other brands and products that I never knew existed. Some worked out and have since become my favourites and some didn’t. It’s all part of the process and it doesn’t need to be stressful. I had thought that natural products wouldn’t work as well, would cost a fortune or I’d end up smelling like incense but I’ve been pleasantly surprised at the range, quality and price on offer. And things will only get better as the demand for more natural skincare grows. Some of my favourite products are sold in mainstream stores like Sephora now so it shows that things are changing. I hope to write more about natural beauty on the blog here in the coming months (favourite products, new discoveries etc) as it’s still a learning curve for me and I’d like to share what I’m learning along the way. Would love to hear your recommendations of natural products that you love. Do you have any favourites? During and following my Clear Passage therapy I’ve been instructed to drink isotonic sports drinks to help with oedema and to replenish my electrolytes. The only thing is that a lot of those sports drinks are full of sugar which I hated drinking because of the high sugar and they weren’t agreeing with me. So I was delighted when I came across these electrolyte drops which I can add to my water instead. The drops are going to last me ages so are way more cost effective than the sports drinks too! I’ve always thought zoodles/courgetti etc were a great way of getting more veg into my diet and love how they add a bit of novelty to my lunches and dinners so I was excited to try out the Morphy Richards Spiralizer Express this month. Normally I just use a julienne peeler, which means that the zoodling (I think I just made up a word there) options available to me are somewhat limited to carrots, parsnips and courgettes with my zoodles being all the one width and straight and only really as long as the vegetable (e.g. length of the carrot). 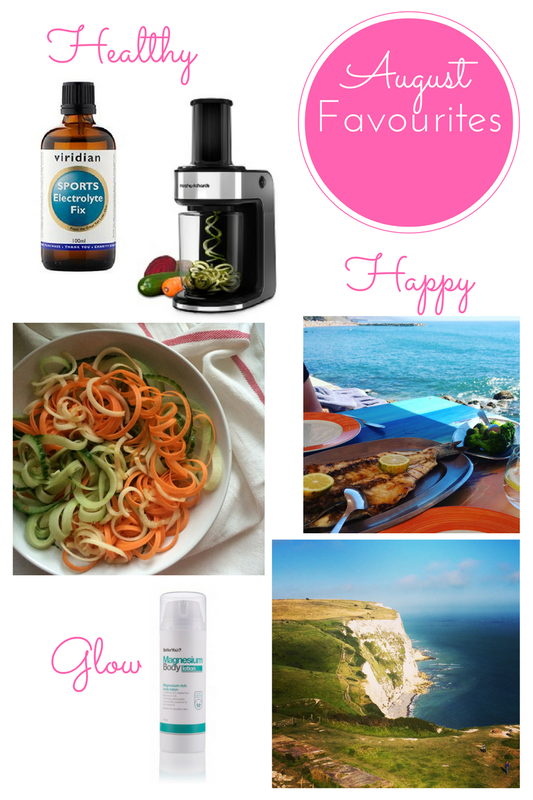 I was pretty content with this until I tried the Spiralizer Express which opened up a whole new world of much longer and more curly zoodles! I could also spiralize a wider variety of fruits and veg including apples, butternut squash, beetroot and celeriac which wouldn’t have worked very well with my julienne peeler. The spiralizer has two options for width of zoodle – one thinner option (like spaghetti) and one thicker option (like linguini). It’s very quick and easy enough to use and clean once I got the hang of things and it came with a small recipe book which has given me plenty of inspiration for future dinners. I think my julienne peeler has been relegated to the back of the cutlery drawer! Traveling always makes me very happy. I love the excitement of heading to the airport knowing that I’m heading off on a bit of an adventure (or at least a break away from my everyday routine). In early August I travelled to both Lisbon in Portugal and Kent in the UK. Lisbon was hot and sunny, colourful and lively. We made the most of our short weekend visit and headed to the breezy coastal towns of Cascais and Ericeira, both of which have very different vibes. Cascais being a bigger, more glamourous town with big hotels and plenty of restaurants while Ericeira being a more relaxed fishing and surfing village with lots of white washed houses and narrow cobble streets. I had one of the best meals I’ve ever had in Ericeira – a little beach side shack that served fish. You picked the fish you wanted from their tank which was then grilled and served with lemon, salt and olive oil. No fancy dressings or marinades or spices. It was ridiculously fresh and tasty! With a side of broccoli, it was a filling and satisfying lunch and the views from our table weren’t too shabby! Then in Kent I got to visit so many English towns and villages – from medieval Sandwich and seaside town Whitstable to bustling Canterbury with its famous cathedral to Dover where I hiked the stunning white cliffs. We got to eat al fresco a good bit that week which is always a novelty, my favourite place being a pub right on the beach with the cliffs of Dover as its background. Travel is definitely good for the soul! While in Kent, I picked up Better You Magnesium Body Lotion. I’m always keen to try different body creams and lotions and had been wanting to try one with magnesium for a while. Soaking into the skin, the magnesium is supposed to soothe and relax. I’m not sure if I noticed a huge difference on that end but I’m not too disappointed as not only does it contain magnesium oil but also shea butter, cocoa butter, coconut oil and vitamin E which are all fantastic moisturisers in my book. I found it to be nourishing but not greasy like some body lotions I’ve tried before and it’s been great on my sensitive skin too. One I’d buy again for sure. 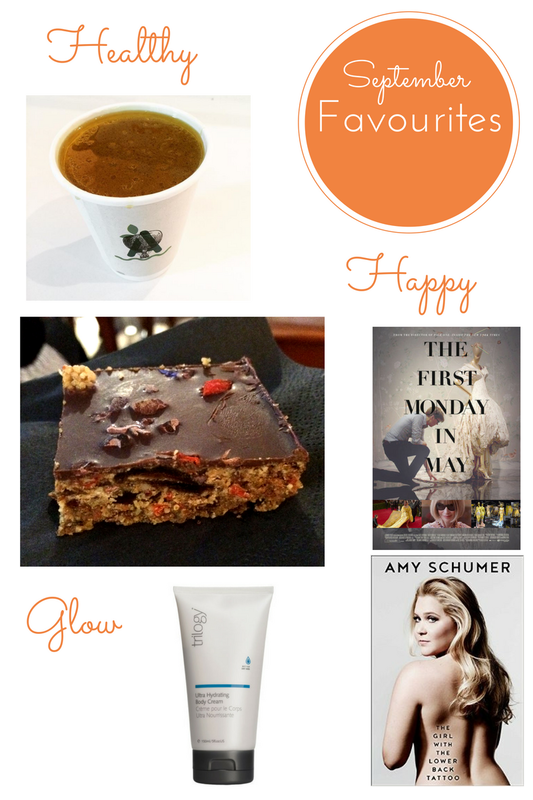 Here’s what’s been making me healthy, happy and glow in July! It’s the middle of summer (for Ireland that means a lot of rain!) but we did manage to get some scorching hot days in July. On those days it’s nearly rude not to have ice-cream. I love the healthy, dairy-free, refined sugar free, Irish brand Nobo. They’ve got a great range of flavours from creamy Vanilla to fruity Mango and Passionfruit, zesty lemon to decadent Salted Caramel to name a few of my favourites. They’re made with a base of coconut milk and avocado and honey with no nasties! I’ve to try to up my protein intake as my blood-work shows that I am low (it can happen with Crohn’s). One way I’ve been trying to sneakily add in some protein is by adding moringa powder to my morning green smoothie. Moringa is rich in vitamins, minerals, and amino acids and contains significant amounts of vitamins A, C, and E along with calcium, potassium and protein. I’ve been using Aduna Moringa powder which comes in a variety of sizes and I’ve also seen that they’ve a Raw Energy Bar too which I’ll have to try. This month I’m loving the long evenings of summer, the milder weather, the abundance of produce at the farmers market and being a tourist in my own city and country. I don’t know why but I do way more daytrips during the summer and I can see why tourists come to Ireland. It’s a beautiful country. It’s the time of year when more skin is on show and as I don’t really tan naturally I love applying some fake tan. 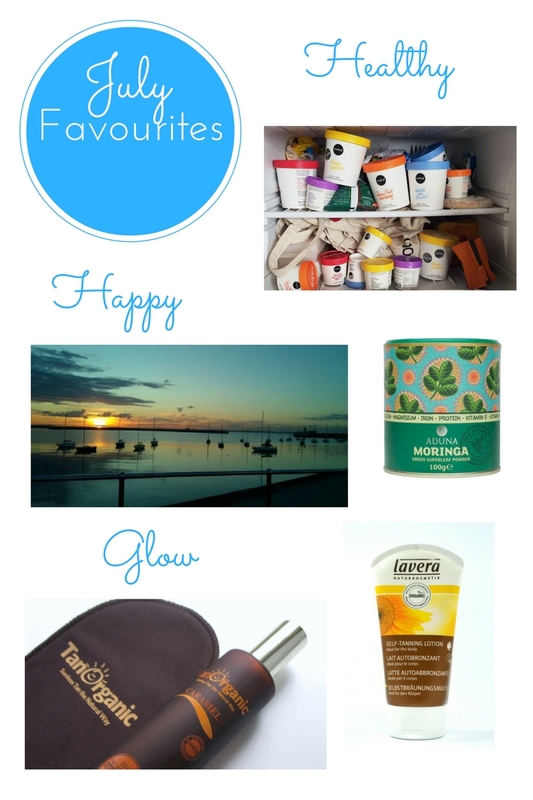 My two favourites this month are Tan Organic and Lavera Self Tanning Lotion. What I like about Tan Organic is that you can see the liquid go on so it’s easy to make sure there are no patches, it develops over a few hours into a very natural colour and it’s an Irish product. However, it can be a little messy (dirty clothes) and you need to wash it off. The Lavera Self Tanning Lotion on the other hand is just like a body lotion that you work into your skin and it develops over a few hours. It develops to a lovely colour, you don’t have to wash it off, it doesn’t stain clothes and it actually smells nice. It doesn’t go on as a colour straight away so you need to be mindful of making sure everywhere is covered. I’d recommend a tanning mitt for applying Tan Organic and washing your hands very well after applying the Lavera lotion to avoid tan hands! Have you tried Nobo ice-cream or moringa powder? I’d love to hear recommendations for a nice natural fake tan.